Saturday 6th October represented a first for MRTeam when we hosted a Network Function with members of the Milton Ulladulla Rotary Club and Milton Ulladulla Business Chamber, as well as MRTeam Sponsors & Supporters. We were thrilled to accommodate our guests with tours of the workshop, race car transporter, engine assembly and dyno tuning room. 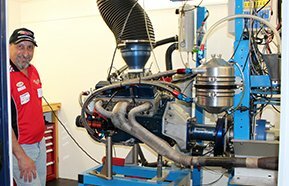 The afternoon included engine dyno testing/tuning demonstrations and the preview of our first professional video production which has now been released to the public. The general reaction from our guests was one of awe and appreciation. It was an eye opener for the majority of guests in to the facilities and equipment that make up MRTeam Headquarters - The foundations of a V8 Supercar team in the making right on their doorstep.